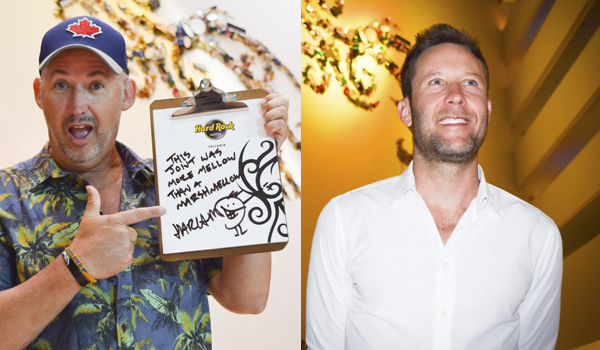 New York actor Michael Rosenbaum chose the Hard Rock Hotel Vallarta to relax for a few days on vacation; Canadian comic Harland Williams was also present during that time. The Riviera Nayarit is such a great destination that even after the recent profusion of celebrity and super model sightings, a super villain decided to visit Mexico’s Pacific Treasure. Who, you may ask? It was, in fact, Lex Luthor. American actor Michael Rosenbaum, who played the nemesis of the beloved Superman on the small screen series, Smallville, for 10 years, decided to indulge in a little R&R at the Hard Rock Hotel Vallarta in early September. During that same time period, Canadian Harland William—noted actor, comedian and radio personality, who has been seen in movies such as Dumb and Dumber and There’s Something About Mary—was also seen being pampered at the Hard Rock Hotel in Nuevo Vallarta, Riviera Nayarit. Both have participated in dozens of films and TV series, so it’s possible their thousands of followers might want to follow in the footsteps of their favorite celebrities and be inspired to visit the Destination as well.